Find restaurants in Other, NY and other fun things to do. View our list of attractions, activities, events, restaurants and visitor information. Restaurant, Cafe, and Performance Space. 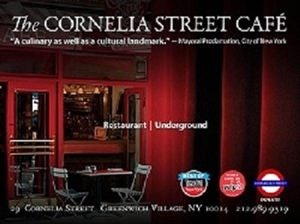 The Cornelia Street Café is owned and operated by founder Robin Hirsch, Angelo Verga, and chef Dan Latham. It is open seven days a week, serving breakfast, lunch, dinner, and weekend brunch. Special discount coupons for pizzas, chicken wings and more - Best Pizzeria in Rochester NY. Marvin Mozzeroni's serves pizza, pasta, subs, salads and chicken wings. Marvin Mozzeroni's provides delicious food and catering services for events both big and small. New American Restaurant Villanelle brings the bounty of the countryside to the city.